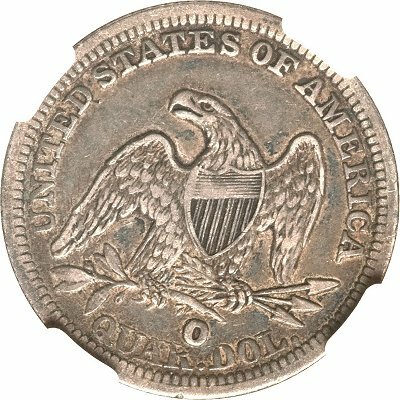 The 1854-O Huge O is probably the most obvious, and one of the most popular, Liberty Seated Quarter varieties. Long recognized and listed in the Redbook, it has been assigned PCGS Coin #5434. The extremely large and misshapen mintmark makes the 1854-O Huge O a “naked eye” variety with a unique appearance that has undoubtedly contributed to its popularity, even amongst those who don’t consider themselves quarter collectors. At current price levels examples are continuously available in the market place in grades from VG to VF; examples better than VF appear infrequently. The 1854-O Huge O is very scarce, but not rare by seated quarter standards. A total of 12 examples were reported in the 1993 LSCC survey, 14 in the 2007 survey, and 32 in the 2013 Top 25 Seated Quarter Variety Survey (expected to be published in the Fall Gobrecht Journal). The recognition and popularity of the variety makes it possible to look at some history of pricing, with the help of Bob Foster, who published rarity analyses of the seated quarters in the Gobrecht Journal in 2000 (Issue #78), 2005 (Issue #93) and 2007 (Issue #100). He specifically focused on the issue and commented regarding its pricing in the first two articles. 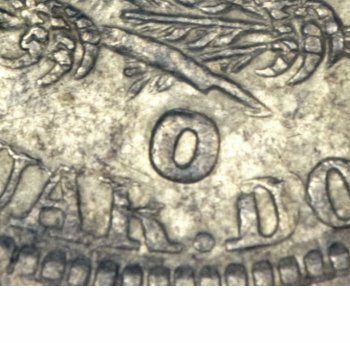 Mr. Foster ranked the 1854-O Huge O as the third most underrated seated quarter in 2000 with Coin World Trends prices of $90 in Good, $350 in VF, and $750 in XF. Five years later those prices had increased to $600 in Good, $3000 in VF, and $5000 in XF. Today’s (2013) prices are $900 in Good $4500 in VF, and $7500 in XF. It is also interesting to look at recent certification history. There were 41 pieces certified in all grades by PCGS and NGC combined in 2007, that number had increased to 77 (43 at PCGS and 34 at NGC) by 2011, and now stands at 108 (67 at PCGS and 41 at NGC). Approximately one new example per month has been certified at PCGS over the past two years. The large majority of certified examples are in lower grades, with only 9 of the 67 PCGS coins in XF, 2 in AU, and still no mint state examples known. Photo Courtesy of Heritage.